Untreated tooth decay is the most common chronic disease in children, so the ADA deemed the month of February National Children’s Dental Health Month to change that! By sharing with our children how dental health impacts our overall health, heart, brain, and more, we can ensure they understand the importance of brushing and flossing. Make sure they’re always smile-ready by using these dental health activities for kids to make good habits stick. Educating children about the importance of dental health is key to a lifetime of healthy teeth and gums. As a dental professional, parent, or teacher, help to spread the message of about why proper dental health habits give more than just a white smile. To help you get started, here are 3 dental health teaching aids guaranteed to make brushing and flossing more fun! This hands-on activity for the kiddos teaches them about plaque hiding places and the importance of brushing well! Start by “brushing the teeth” using the white paint, toothbrush, and egg carton. Once the paint is dry, it’s time to floss! Work with your tot to place “plaque” (moldable dough) in between each egg carton crack. Then use the floss to remove the dough from each tooth. Establishing good dental health habits early on promotes a lifetime of healthy teeth. Just like adults, kids should be brushing twice a day and flossing once a day. To keep track, place this chart in the bathroom. Teach them to track their daily dental dose with our brushing and flossing chart. Let your child color in each circle after brushing or flossing. Stickers are a fun alternative for marking, too! 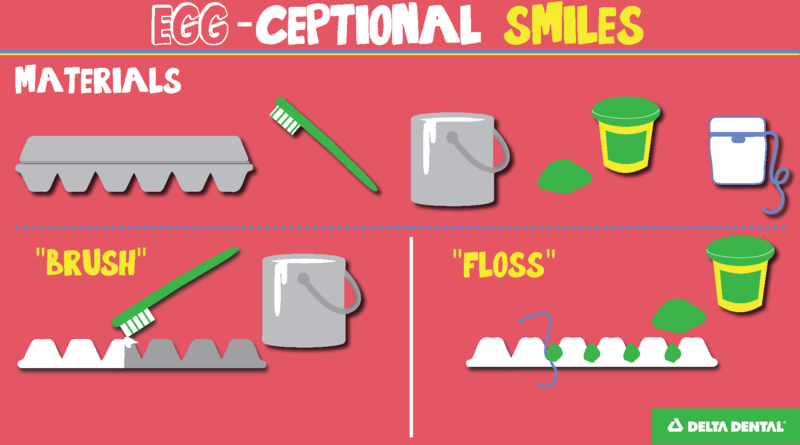 Teach your tot how to maintain a healthy mouth by educating them on these terms that keep smiles sparkling. Work with your child to unscramble the words and discuss how each helps to maintain a healthy mouth! For more creative ways to get kids excited about dentistry, check out our Dental Health for Kids Pinterest Board. Editor’s Note: Content updated February 2019.